THE MARTINI CHRONICLES: Surviving Mamahood! 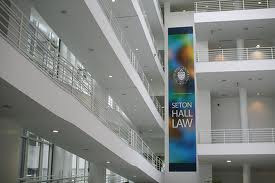 Seton Hall Law School...Where the foolishness all began! When I started law school back in 2002, I had no clue that I would meet one of my best friends during the first week. But somehow the planets aligned perfectly, and I found myself in a study group with a true Puerto Rican Princess. Eleven years and two bar exams later, my good friend has decided to start a blog that puts a lighthearted spin on her most important job: being a mother. You see, in addition to being a brilliant and successful attorney, my friend is also a fabulous mother of 3. Somehow, she has mastered the art of balancing her professional life with her personal and family life...she makes it look effortless! I aspire to be so well put-together. Since she is such a great friend, the PRP has agreed to guest blog here on the Chronicles to share her take on "mamahood." I know many of you Chronicle readers can relate since you are skilled jugglers at being professionals and parents. And since this is new territory for me, I am receptive to any advice. As such, join me in welcoming my friend to the Chronicles. And, don't forget to check out her new blog "Surviving Motherhood." Enjoy! Thank you, Pro Diva for allowing me to guest on your blog. I aspire to be as fabulous as you are one day! This post is in honor of your most recent journey into mamahood. Over the last few years I have had the pleasure of witnessing some very good friends enter the mamahood for the very first time. My youngest is now entering toddler-hood, but I can still recall his newborn stage quite vividly. The truth is that this baby phase can be difficult to navigate whether you are a newbie mama or an old pro. (1) Your newborn is equipped with a particular set of skills. Those skills include, crying, eating, pooping, and sleeping. These may not seem like much, but newborns are natural multi-taskers. They can easily transition from one skill to another while sometimes demonstrating two or more skills at once! For example, pooping can be combined with eating, crying, and sleeping! Who says babies are boring?! (2) Did I mention that newborns like to poop? It cannot be overstated enough: newborns. poop. lots. In the beginning they go pretty much every time they eat, which is very frequently. So, steel yourself mentally and dress appropriately for diaper changes. A rain coat and eye protection are a must. (3) Babies are like honey badgers. They don't give a f*ck. The truth is that babies aren't supposed to care whether you are tired, hungry, disheveled, or unwashed. If you find yourself groggily trying to reason with your newborn at 3:00 a.m., using phrases like "But mommy has to work in the morning" or "I'll pay you for one more hour of sleep" - know that your precious baby does not accept AMEX. See number 1 above for the complete list of newborn concerns. Take heart as this stage doesn't last forever. Eventually they will be able to clearly tell you that they don't care - which is a step up from crying all the time! (4) Human babies are amongst the most defenseless in the animal kingdom - unless they get ahold of a lock of your hair. 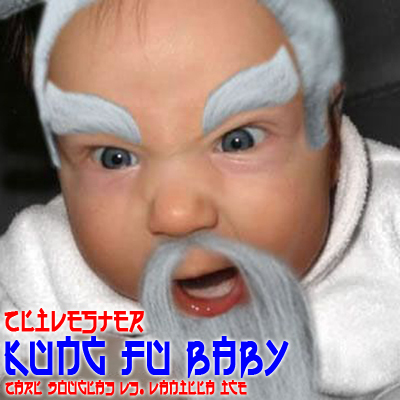 With your hair firmly grasped within their tiny baby claws, they transform into Kung-Fu-Master-Jedi-Knights with the power to rip your scalp clear off your head. Therefore, wear a hair net whenever possible. Even better just go ahead and shave your head. (5) Infant poop is a master of misdirection. It can appear at a moment's notice or with no notice at all! Just opening a diaper thinking that you're changing a number 1? Surprise! It's number 2. Just cleaning up after an epic number 2? Too slow! Here comes the encore. Felt sure that the baby must have done a poop, but upon opening the diaper, you realize that the poop is gone? Look down. There it is on the floor! Never underestimate your opponent, folks. (6) Older babies completely lack the basic instinct of self-preservation. They are naturally fearless creatures who will not hesitate to roll themselves off any available high surface. They really can't help it. Install some carpets around typical landing zones - bed, next to sofa, changing table, etc. Disclaimer: of course the best prevention is keeping a close eye on the little bugger so they don't actually perform this particular magic trick. I speak from experience here (ok, ok, maybe three or four experiences - tops). (7) Babies are natural connoisseurs. Their palates are quite sophisticated and like the evil chef in Ratatouille, they will not hesitate to slap an unsatisfactory spoonful of banana-barely-quinoa purée out of your shaking hands. Don't take it personally mama. View it as encouragement. Your baby is just testing you to prove how strong you are! 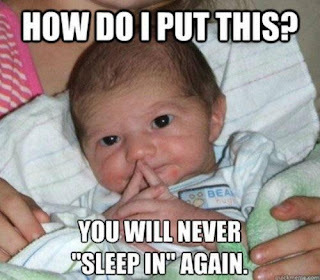 (8) Your newborn is very much like an under-achieving college kid: she sleeps during the day so she has enough energy to party like a rock-star at night! This too is entirely normal and will pass as she begins to fall into a more predictable sleep pattern. In the meantime, catch those zzzzz's while you can. If sleeping during the day is not possible for you, I got one word for you: coffee. Above all, though, remember that your newborn won't be new forever! Soon, those cranky frowny faces will give way to smiles, coos, and giggles. Sleepless nights will get less sleepless (maybe not entirely restful, but better) and feedings more predictable. 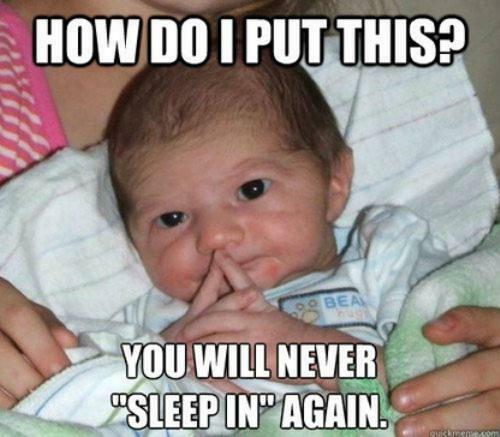 So to those of you in the newborn trenches: hang in there baby! The best is yet to come. Also be sure to follow @MamahoodDiaries on Twitter! #4 is so true. Their grip is amazing! I think I once heard that they can hold their own bodyweight with their grips. Great post and absolutely hilarious! Too funny! LOL don't forget about that wonderful smelling perfume they love to deposit on you. Sour will be your new signature scent! I think I heard that somewhere too! Told you this chick was hilarious! It's even worse when you know here in real life because I can picture and hear her saying all of this! I am quickly becoming familiar with that scent!